GCA acted as exclusive financial advisor to Onvia, a leader in sales intelligence and acceleration for businesses selling to the public sector, which has entered into a definitive agreement to be acquired by Deltek, a subsidiary of Roper Technologies. This marks GCA's 24th transaction in the software and tech-enabled services sectors since the start of 2017. Onvia Inc. (NASDAQ: ONVI) creates mutual value for public and private sectors, taxpayers and society at large by connecting and accelerating the multitrillion-dollar business-to-government market. Onvia enables customers to grow their sales pipeline with access to bids, RFPs and future spending data, along with agency contacts, competitor information and market analytics. The solution is backed by Onvia's smart search technology, CRM integration and expert support. Deltek Inc., a subsidiary of Roper Technologies Inc. (NYSE: ROP), is the leading global provider of enterprise software and solutions for government contractors, professional services and other project-based businesses. The acquisition of Onvia is intended to further strengthen Deltek’s GovWin IQ information solution offering by adding state, local and education market intelligence. 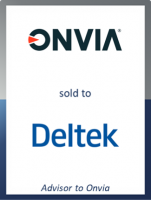 Under the terms of the agreement, Deltek’s parent company will acquire all the outstanding shares of Onvia’s common stock for $9.00 per share in an all-cash tender offer. The offer price represents a 100% premium to Onvia’s closing stock price on October 2, 2017.